A Swift Boat is sunk by two rockets from an unidentified aircraft near the border between North and South Vietnam. It is June 15/16th, 1968, around midnight, and now five sailors are dead or missing. Two survivors and several witnesses report seeing lighted aircraft that move and hover like helicopters flying in the area. U.S. Jets are scrambled to the scene and report hits on enemy aircraft. The following night the jets return hunting the elusive helicopters and in the confusion, one American Cruiser and one Australian Frigate, are hit by air-to-air missiles. The result is two dead and eleven wounded aboard the Australian ship and minor damage to the American Cruiser. An investigation, based on pieces of U.S. Missiles found on the two ships, determine that it was “friendly fire”. This sailor was aboard another Swift Boat, PCF-12, patrolling south of the sunken boats position. Ordered to the scene to assist in the rescue, PCF-12 came under attack by helo type aircraft, identified as hostile, receiving one rocket and machine gun fire. This Swift Boat returned a deadly barrage of 50 caliber machine gun and other small arms fire causing the two helos to break contact and run away. The crew believes that one of the helos was damaged or shot down by this hail of gunfire. The investigation findings were “friendly fire” mostly because of the lack of wreckage of the helos and the pieces of Sparrow missiles found on board USS Boston and HMAS Hobart. 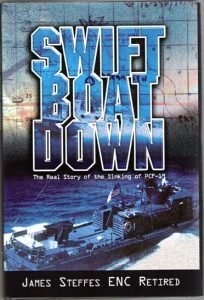 News accounts attempted to connect the two incidents by blaming the same pilots for attacking the ships and sinking the Swift Boat. This book uses official records, logs, and message traffic to back up eyewitness testimonies that refute the “friendly fire” decision. There are many people affected by this story. Those of us that were there have carried pieces of this incident in our memories for 37 years. Families and friends of the dead and missing have wondered about the truth behind the decision of “friendly fire” vs “hostile fire”. This book will answer many of those questions and put many lives at rest again.